Many of my readers know that in a previous life – 9 years ago now – my husband and I took 16-months off and road our bikes around the world. It was this adventure where I started to blog seriously for the first time. It is also where the domain name Going East came from – we left from Ottawa and went east until we got back home – hence going east. In addition to blogging, I also started following blogs. I read them obsessively to help prepare for the trip and during our trip. We had guidebooks and maps for the places we visited, but they were of limited use. Guidebooks were often years out of date and not bicycle touring specific. Maps showed major roads, but not the good roads for cycling. When crossing international borders, we also needed to know what the current visa situation was – something that guidebooks cannot keep up with, and even government websites aren’t always current. We did, however, find that we could following bloggers who were a few weeks ahead of us, following a similar path, and use their experience as a way to help guide us. 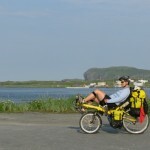 The information they provided was both bicycle touring specific and current. In addition, we could reach out to those who were a couple weeks ahead of us and ask them specific questions. They often were happy to share their experiences, and if our paths crossed we even met up in person. It occurred to me that this is very much like academic literature and blogs for breast cancer treatment. The academic literature is well researched, but also years old (it takes years to get published) and only provides the perspective that the scientists/clinicians care about, not the information that patients care about. The academic literature is the ‘guidebook’ for breast cancer. Where breast cancer blogs, and other social media, provide more specific information, and often more current information. They share what the patient is experiencing, often as they are experiencing it. In addition, many breast cancer bloggers are happy to share their experience with anyone who sends them a note. I know that I am. I know that several of the bloggers who I follow were happy to talk to me when I needed it. My point is that guidebooks and academic literature provided well researched information that is of general interest to a target audience. The cycle tourist and patient experiences are specific audiences that are not the target of guidebooks and academic literature. If you want more current information, and you want more specific information, then blogs (and other social media like Twitter chats and Facebook Groups) can fill that gap. It is not just that social media help provide information and context on what it means to actually live with illness, it is also that they provide more current information and information that is of specific interest to patients.